The following images and footage represent yet another remarkable daylight capture of a distinct silver disc making maneuvers in the sky. We would like to thank Patrick U. for making these available to us in MPEG format and the time he's put into isolating the most unique flight patterns of what he shot. More and more, the video evidence is mounting, bringing the UFO phenomena into crisp, sharp clarity for all to see.  This saucer appears to have the classic black or less reflective flat bottom and highly reflective or silver top. There is no vapor trail visble. No sound was heard. Yet again... Speculations are being made that the above video is nothing more than a common mylar balloon. However, examination of such balloons will reveal that they are nothing alike, save for being circular in shape and reflective. The big difference between the Mylar balloons, commercial and recreational, is that none of them have a flat bottom and raised top. Only small, backyard "tossing saucers" have anything close to a flat bottom and they cannot reach altitudes as seen in the video. The commercially available backyard "Hover Disc" toy holds just enough helium to keep it semi-suspended for nice, long glides at about 4 feet off the ground and are used like a frisbee. They cannot attain high altitude. They are also brightly colored and decorated. Well, your examples and graphics and logic are all admirable, but I still have to challenge you on this, Peter. First, you've misunderstood one element of my graphic, which is the 'commercial' mylar balloon on the left (I gave a URL for an example of these, but I guess it was still a bit confusing - my bad)... they are rather large (anywhere from 4 feet to 12 feet in diameter) and have some kind of small fan/motor device as a gondola attached to the bottom, which is also part of the balast to keep it level. The "string" element would apply only to a mylar party balloon -- I wanted to clarify that. Pat U of Venice CA recently decided to buy a few Mylar balloons and put them to the video test. He launched a large backyard "flying disc" type of toy as well as a typical mylar party balloon. The video footage not only demonstrates the dissimilarity between the UFOs captured on videotape (above), but also confirms that the size of such balloons would have to be rather immense to produce the kind of difficulty in focus and distortion on video represented by extreme altitude and distance from the camera. These demonstrations lay the mylar balloon argument to rest. Mylar balloons look like mylar balloons. Flying saucers look like flying saucers! While there are certain undeniable similarities... its silver, its round or disc shaped, its airborn, the two videos are distinctly different. A few people have suggested to me that the UFO I videotaped over Venice, CA on May 2nd, 2004 is most likely a mylar balloon. I find this amusing, because what they are actually saying is that I don't know what a balloon looks like. As my girlfriend also saw the UFO, they are also suggesting that she has the same problem. I will attempt to vindicate myself. I have conducted a balloon test to show people what an airborne mylar balloon looks like with the hope that they will compare the mylars to the Venice UFO and see that the UFO has very different properties from those of a mylar balloon. On June 12th, 2004, I set out to perform the test. I purchased two mylar balloons and went down to the exact same location where I saw the UFO on May 2nd - the intersection of Rose and Hamilton Avenues. Although five weeks had passed since the original sighting, I made sure that conditions were as similar as possible, with the sun high over head in midday position. A friend of mine held the balloons, walked across the street, and waited for a signal. I turned on the video camera, gave the signal, and the balloon tests began. First we launched balloon 1 - the big UFO shaped balloon. This balloon was designed and decorated by the manufacturer to have the appearance of a UFO. We released the balloon and videotaped it for as long as we could. 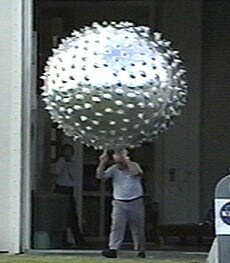 Then we launched and videotaped balloon 2 - a smaller, rounder mylar balloon, commonly used for celebrations and parties. The result of these tests can be viewed in the two MPEG clips I have presented. I invite everyone to take a close look at what a mylar balloon looks like and to decide for themselves. 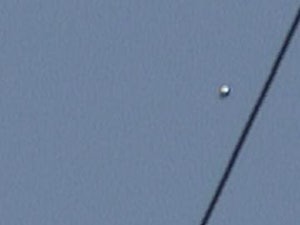 Even at great distance, seen with the camera's zoom lense, they are clearly balloons and not anomalous. The Venice UFO, however, had too many properties that were difficult to explain: rapid rotation, movement independent of the wind, extreme change of direction, and a fuzzy distortion around the craft at times. I would have to say that mylar balloons, at whatever distance, clearly look like mylar balloons. The UFO-shaped balloon became flimsy with increased altitude as the air pressure around it decreased. Both balloons twirled and bobbed frequently, moving irregularly with the afternoon breeze. They did not look like solid stainless steel, but rather like metallic inflated bags. The most remarkable difference between the mylar objects and the Venice UFO was that of size and distance. The Venice UFO was visible as a dark spot even at extremely high altitude. It's metal surface gave off a brilliant reflection at over 1,000 feet, whereas the mylar balloon did not. This seems to indicate the disc was large, although how large I can't say. There was no reference for its size. The balloons, on the other hand, were out of visual range in a only a few minutes. We simply could not maintain visual contact due to their small size. But enough of my rambling on. Please enjoy the clips and watch for yourself. If there is anything unsatisfactory about these tests, please let me know at LAUFO.com. 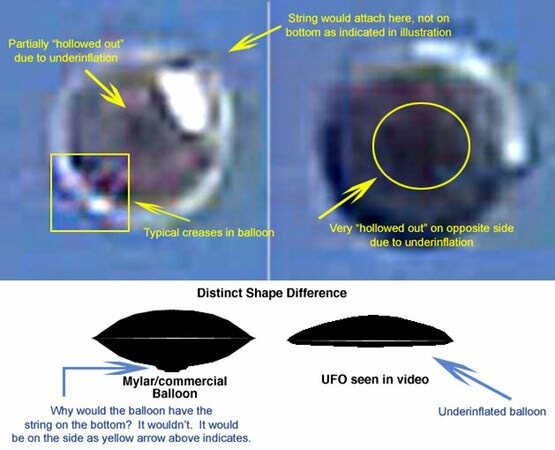 I will be more than happy to release and videotape more mylars, because I know that no matter what I do, mylar balloons will have very different properties from the UFO filmed over Venice on May 2nd, 2004. Of that I am absolutely certain. Best wishes to all and enjoy the show!